While Japan had previously relied on nuclear power to meet about 30% of its electricity needs, after the 2011 Fukushima Daiichi nuclear disaster, all nuclear reactors were progressively shut down for safety concerns. Since then, Ōi Nuclear Power Plant's reactors 3 and 4 were restarted on 14 March 2018, and 9 May 2018, respectively. On 11 August 2015, and 1 November 2015, the two reactors at the Sendai Nuclear Power Plant restarted. Following the Fukushima disaster, the general public has opposed the use of nuclear energy. In 1950, coal supplied half of Japan's energy needs, hydroelectricity one-third, and oil the rest. By 2001, the contribution of oil had increased to 50.2% of the total, with rises also in the use of nuclear power and natural gas. Japan now depends heavily on imported fossil fuels to meet its energy demand. On 3 July 2018, Japan's government pledged to increase renewable energy sources from 15% to 22–24%, including wind and solar by 2030. Nuclear energy will provide 20% of the country's energy needs as an emissions-free energy source. This will help Japan meet climate change commitments. Oil demand has been waning in Japan, especially leading up to and since the Tohoku earthquake in 2011. While oil consumption was over 5 million barrels per day (bpd) for decades, this had declined to 3.22 million bpd by 2017. As of 2016, India, Saudi Arabia and Texas have overtaken Japan in oil consumption. A further decline to 3.03 mln bpd or just under 176 million kiloliters (preliminary) was posted in 2018. After the 2011 earthquake and tsunami, some nuclear reactors were damaged, causing much uncertainty and fear about the release of radioactive material, as well as highlighting the ongoing concerns over seismic design standards (see Nuclear power in Japan §Seismicity). On 5 May 2012, Japan shut down the last nuclear reactor, the first time there has been no nuclear power production since 1970. On 16 June Prime Minister Yoshihiko Noda ordered the restart of Ōi nuclear plant's reactors number 3 and 4, saying that people's livelihood needs to be protected. Ōi nuclear plant's reactor No. 3 was restarted on 2 July, and No. 4 began operation on 21 July. However, in September 2013 the Ōi nuclear plant was shut down in order to have extensive safety inspections performed. By late 2015, both of the Sendai Nuclear Power Plant's reactors had reopened and restarted producing nuclear energy. Other nuclear plants, such as the Takahama Nuclear Power Plant, have received permission to reopen, and other nuclear reactors are beginning the process of restarting. Because domestic natural gas production is minimal, rising demand is met by greater imports. Japan's main LNG suppliers in 2016 were Australia (27%), Malaysia (18%), Qatar (15%), Russia (9%), and Indonesia (8%). In 1987, suppliers were Indonesia (51.3%), Malaysia (20.4%), Brunei (17.8%), United Arab Emirates (7.3%), and the United States (3.2%). The new Japanese LNG strategy published in May 2016 envisages the creation of a liquid market and an international LNG hub in Japan. This promises to radically change the traditional JCC (crude oil) based pricing system in Japan, but also potentially in the Pacific Basin as a whole. But the path to hub creation and hub pricing in the early 2020s envisaged by the Strategy will not be straightforward. The country's main renewable energy source is hydroelectricity, with an installed capacity of about 27 GW and a production of 69.2 TWh of electricity in 2009. As of September 2011, Japan had 1,198 small hydropower plants with a total capacity of 3,225 MW. The smaller plants accounted for 6.6 percent of Japan's total hydropower capacity. The remaining capacity was filled by large and medium hydropower stations, typically sited at large dams. Cost per kilowatt-hour for power from smaller plants was high at ¥15–100, hindering further development of the energy source. Japan was the world's second largest producer of photovoltaic electricity in the early 2000s, although solar was a very minor contribution to the total at that time. The country was overtaken by Germany in 2005, a year in which Japan had 38% of the world supply compared to Germany's 39%. Since then, Japan had been slow to increase solar capacity compared to other countries until 2012. On 1 July 2012, after the nuclear disaster at Fukushima, new tariffs for renewable energy were introduced by the Japanese government. The tariffs, set at ¥42 per kWh over the next 20 years to solar power producers, were among the highest in the world. With the incentives in place, Japan added 1,718 MW of solar power in 2012. By the end of the year, Japan's total solar capacity was 7.4 GW. Japan has seen sustained growth of solar PV capacity after 2012, reaching a cumulative installed capacity of 34 GW by the end of 2015, generating 3.5% of the national electricity consumption in that year. Of other renewable energy sources, Japan has partially exploited geothermal energy. The country had six geothermal power stations with a combined capacity of 133 megawatts in 1989. By 2011, the country had 18 geothermal plants. Japan has the third largest geothermal reserves in the world, and geothermal energy in particular is being heavily focused on as a source of power following the Fukushima disaster and subsequent shutdown of all nuclear reactors. The Ministry of Economy, Trade, and Industry is currently exploring over 40 locations to see if geothermal energy plants would be compatible. In 2014, Japan ranked fifth in the world by electricity production, after the United States, China, Russia, and India with 934 TWh produced during that year. Japan had 282 GW of total installed electricity generating capacity in 2010, the third largest in the world behind the United States and China. However, after the damage by the 2011 earthquake, capacity is estimated to be around 243 GW in mid-2011. It is one of the world's largest users of solar energy, in fourth place behind Germany, Italy, and China. With 53 active nuclear power generating reactor units in 2009, that year Japan ranked third in the world in that respect, after the United States (104 reactors) and France (59). Almost one quarter (24.93%) of its electricity production was from nuclear plants, compared to 76.18% for France and 19.66% for the United States. However, after the 2011 Tōhoku earthquake and tsunami and the subsequent Fukushima Daiichi nuclear disaster, all plants eventually shut down in May 2012 and Ōi Nuclear Power Plant was restarted and operational between June 2012 and September 2013. On 11 August 2015 and 1 November 2015, the two nuclear reactor of the Sendai Nuclear Power Plant were restarted respectively. Unlike most other industrial countries, Japan doesn't have a single national grid but instead has separate eastern and western grids. 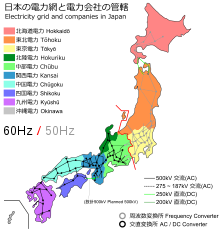 The standard voltage at power outlets is 100 V, but the grids operate at different frequencies: 50 Hz in Eastern Japan and 60 Hz in Western Japan. The grids are connected together by 3 frequency converter stations (Higashi-Shimizu, Shin Shinano and Sakuma), but these can only handle 1 GW in total. A converter station also exists at Minami-Fukumitsu. The 2011 Tōhoku earthquake and tsunami resulted in 11 reactors being taken offline with a loss of 9.7GW. The 3 converter stations did not have the capacity to transfer enough power from Japan's western power grid to significantly help the eastern grid. The two grids were originally developed by separate companies. Tokyo Electric Light Co was established in 1883, which also established electric power in Japan. In 1885, demand had grown enough that TELCO bought generation equipment from AEG of Germany. The same happened in the western parts of Japan with General Electric being the supplier to Osaka Electric Lamp. GE's equipment used the US standard 60 Hz, while AEG's equipment used the European standard of 50 Hz. In March 2016, METI set a target of 40,000 hydrogen fuel-cell vehicles on Japan's roads by 2020 and 160 fueling stations. In 2014, Japan was the 6th largest producer of carbon emissions. In 2013, Japan ranked 28 in the list of countries by carbon dioxide emissions per capita. In 2007, the BBC reported that Japan was having difficulty in meeting its 6% reduction target under the Kyoto Protocol, partly because Japanese businesses were already very energy efficient. Despite this, in May 2007, the former Prime Minister Shinzō Abe said that world emissions should be reduced by 50% by 2050. He expected Japan to play a leading role in such an effort. "We must create a new framework which moves beyond the Kyoto Protocol, in which the entire world will participate in emissions reduction," Abe said. 2 production by over 3% despite an electrical demand drop of nearly 15%. ^ "BP Statistical Review of World Energy 2012" (PDF). BP. Retrieved 2 July 2012. ^ a b c d "Nuclear Power in Japan". World Nuclear Association. 2016. Retrieved 20 October 2016. ^ "No. 4 reactor at Oi nuclear plant restarted after nearly five years offline". The Japan Times Online. 10 May 2018. ISSN 0447-5763. Retrieved 20 December 2018. ^ "Japan restarts second nuclear reactor despite public opposition". The Guardian. 15 October 2015. Retrieved 20 October 2016. ^ "Opposition to nuclear energy grows in Japan". Deutsche Welle. 21 October 2016. Retrieved 4 October 2017. ^ Nakamoto, Michiyo (4 April 2012). "Tepco faces revolt over price rise". FT.com. Retrieved 10 December 2012. ^ "4th Strategic Energy Plan" (PDF). Ministry of Economy, Trade, and Industry. April 2014. Retrieved 20 October 2016. ^ Takase, Kae (27 May 2014). "Renewable Energy Burst in Japan". Nautilus Institute for Security and Sustainability. Retrieved 20 October 2016. ^ "Japan aims for 24% renewable energy but keeps nuclear central". Phys.org. 3 July 2018. Archived from the original on 3 July 2018. Retrieved 3 October 2018. ^ "Energy Security in East Asia". Institute for the Analysis of Global Security. 13 August 2004. ^ "Energy Security Initiative" (PDF). Asia Pacific Energy Research Center. 1 January 2002. Archived from the original (PDF) on 20 June 2006. ^ "Japan Oil, Gas and Metals National Corporation". JOGMEC. Retrieved 10 December 2012. ^ Editorial, Reuters. "UPDATE 1-Japan 2017 thermal coal imports hit record, LNG up for..." AF. Retrieved 18 April 2018. ^ "India beats Japan in oil use, only next to US, China". The Economic Times. 9 June 2016. ^ "UPDATE 1-Japan's 2018 crude imports fall to 39-year low as population shrinks". CNBC. 23 January 2019. Retrieved 28 January 2019. ^ Tomoko Yamazaki and Shunichi Ozasa (27 June 2011). "Fukushima Retiree Leads Anti-Nuclear Shareholders at Tepco Annual Meeting". Bloomberg. ^ Mari Saito (7 May 2011). "Japan anti-nuclear protesters rally after PM call to close plant". Reuters. ^ "Nuclear Power Plants in Japan". The Federation of Electric Power Companies of Japan. Retrieved 20 October 2016. ^ Johnston, Eric, "Current nuclear debate to set nation's course for decades", Japan Times, 23 September 2011, p. 1. ^ Batty, David (5 May 2012). "Japan shuts down last working nuclear reactor". The Guardian. London. ^ "Ohi reactors cleared for restart". World-nuclear-news.org. 18 June 2012. Retrieved 10 December 2012. ^ "Japan restarts first reactor since Fukushima – World news – Asia-Pacific | NBC News". MSNBC. 7 January 2012. Retrieved 10 December 2012. ^ "Oi nuclear plant's No 4 reactor begins generating power". Zeenews.india.com. 21 July 2012. Retrieved 10 December 2012. ^ "Japan halts last nuclear reactor at Ohi". BBC. 15 September 2013. Retrieved 20 October 2016. ^ "Four nuclear reactors to reopen in Japan". Euronews. 24 December 2015. Retrieved 20 October 2016. ^ "Country Analysis Brief: Japan". US Energy Information Administration. 2 February 2017. Retrieved 19 December 2018. ^ Stern, Jonathan (2016). "The new Japanese LNG strategy : a major step towards hub-based gas pricing in Asia". Oxford Energy Comment. Oxford Institute for Energy Studies. ^ Japan lags behind Europe in solar power. The Daily Yomiuri, published 2007-05-10, accessed 2007-05-14. ^ Johnston, Eric, "Despite headwinds, solar energy making progress, advocates say", Japan Times, 24 September 2011, p. 3. ^ Harlan, Chico (19 June 2013). "After Fukushima, Japan beginning to see the light in solar energy". The Guardian. London. Retrieved 19 June 2013. ^ Watanabe, Chisaki (27 February 2014). "GE Says Japan Has More Potential to Harness Wind Power". Bloomberg. ^ Demetriou, Danielle (5 January 2009). "Japan taps into power of volcanoes with geothermal energy plants". The Daily Telegraph. London. ^ Johnston, Eric, "Geothermal trove lies mostly untapped despite energy crisis", Japan Times, 27 September 2011, p. 3. ^ Cichon, Meg (29 May 2015). "Is Japan the Next Boom Market for the Geothermal Energy Industry?". Renewable Energy World. Retrieved 20 October 2016. ^ Jiji Press, "Wave, wind power project planned", Japan Times, 20 March 2012, p. 7. ^ "Electricity – Consumption". The World Factbook. Retrieved 20 October 2016. ^ "Electricity Consumption Per Capita 2004 – Country Rankings". Allcountries.org. 25 May 2007. Retrieved 10 December 2012. ^ "Nuclear Power Plants by Country 2009". Photius.com. 25 May 2007. Retrieved 10 December 2012. ^ "Nuclear Share in Electricity Generation by Country 2008". Allcountries.org. 25 May 2007. Retrieved 10 December 2012. ^ "Japan Restarts First Nuclear Power Plant since Fukushima". BBC News. BBC. Retrieved 11 August 2015. ^ "Japan restarts first nuclear reactor since Fukushima disaster". The Guardian. Retrieved 11 August 2015. ^ "Sendai No. 2 reactor in full-capacity operation". Japan News (The Yomiuri Shimbun). 1 November 2015. Retrieved 7 November 2015. ^ "Japan electricity markets: structural changes and liberalization". Eurotechnology Japan. 2014. Retrieved 1 August 2016. ^ "What does liberalization of the electricity market mean?". Agency for Natural Resources and Energy. METI. 2013. Retrieved 1 August 2016. ^ Stephen Stapczynski, Emi Urabe (28 March 2016). "Japan's Power Market Opening Challenges Entrenched Players: Q&A". Bloomberg. Retrieved 1 August 2016. ^ "Electricity market shake-up mainly benefiting Tokyo and Kansai". The Japan Times. 7 April 2016. Retrieved 1 August 2016. ^ "Electricity in Japan". Japan-guide.com. 7 May 2007. Retrieved 10 December 2012. ^ a b c d e Williams, Martyn (18 March 2011). "A legacy from the 1800s leaves Tokyo facing blackouts". Computerworld. Retrieved 21 March 2011. ^ "Dioxyde de carbone (CO2), émissions en mille tonnes de CO2 (CDIAC)". United Nations. 20 November 2006. Archived from the original on 10 March 2007. Retrieved 28 April 2007. ^ "unstats | Millennium Indicators". millenniumindicators.un.org. Retrieved 22 August 2018.